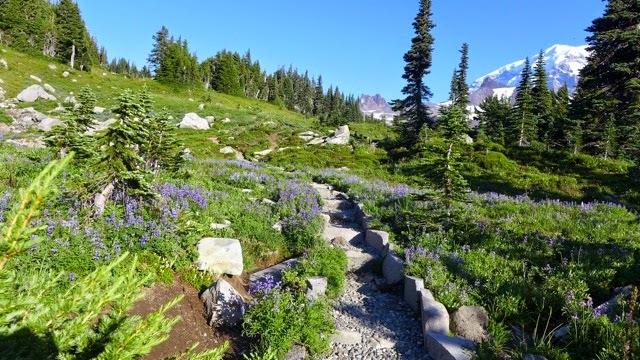 This entry could also easily be titled, "Chasing my Youth", as I backpacked on trails that I used to hike when I was in my 20s and arranged with work to have Wednesdays free just so I could hike at Mt Rainier. In fact, the loop I did for the three-day backpack around Mother Mountain was a day hike I did one of those Wednesdays, all 16 miles. Although I know I did the loop, as I was hiking it the past week, I could hardly remember a lot of it. Wow, I must have been fit back then! I started out from Mowich Lake, after having driven to the Carbon River Ranger Station to get my permit. Back in my 20s, I could still drive to the Ipsut Campground, but now, due to multiple washouts, it had become a hike-in backcountry camp area. When choosing my nightly camp destinations with the ranger, I didn't get my first choice of camps, but that would turn out ok later, when I realized how much elevation there would be on the second day. From Mowich Lake, I hiked to Ipsut Pass, then down the sometimes-rough trail to the Carbon River, then turned upstream. Up until this point, I had been in shade or forest and it started to look like that luxury would be ending. 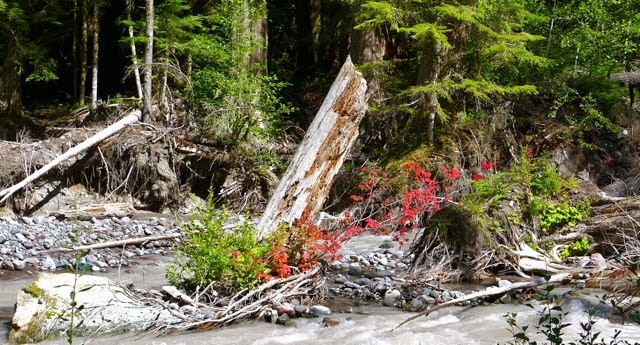 It was a hot, cloud-free day in August and I was not looking forward to baking in the sun, but was soon re-directed to cross the Carbon River on a series of bridges to the trail on the north side of the Carbon River, in forest. I was spared from the ovens. 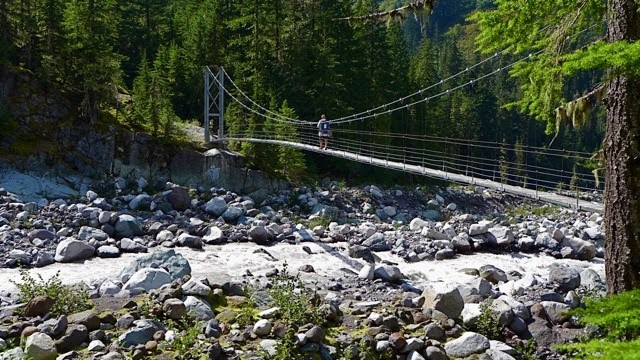 At the next intersection, where the Wonderland Trail continued straight ahead toward Mystic Lake, I crossed the Carbon River back to the other side on one of the fantastic suspension bridges in the Park, high above the river. 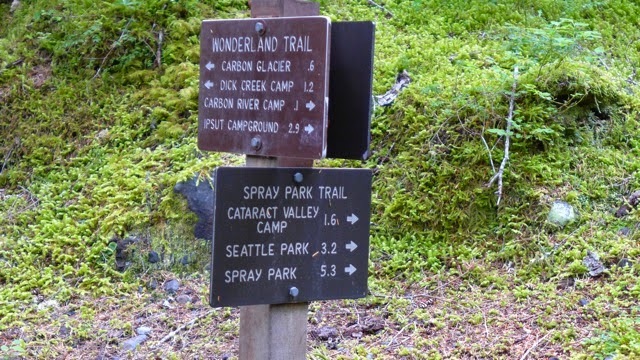 The camp I had originally wanted to stay at, Carbon River, was full and now, after hiking 8 miles with a full pack, I would be gaining 1,400' in 1.5 miles to the Cataract Creek camp, partway up the climb to Seattle Park. 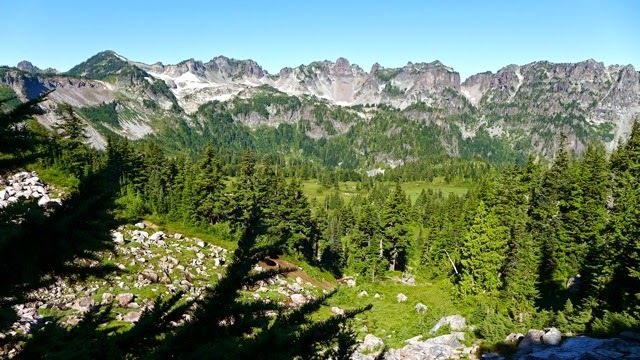 I reasoned with myself that this was a good thing, since the alternative was to do all of the gain to the 6,400' highpoint of the trip in one day, had I stayed at Carbon River. Now, I would be chipping off a chunk of that gain today, making the following day slightly easier. At least that's what I kept repeating in my head as the way became gradually steeper and more rough, with rocks and mud and overgrown brush. 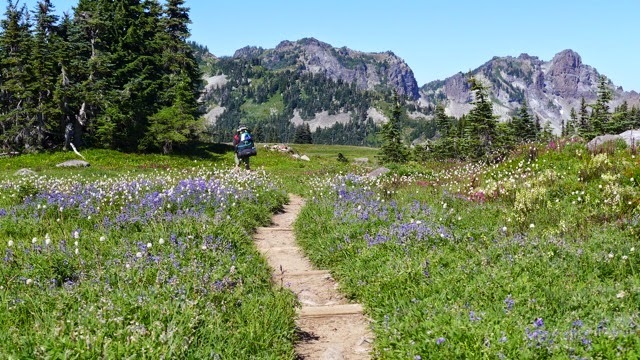 Hiking the Wonderland Trail has its benefits, the greatest being that it is better maintained than most of the other trails in the Park due to its greater number of hikers. But now that I had turned off from that trail, I was entering a bit more of the wild lands of the Park. It was exciting, but also a little annoying, as I slipped and nearly fell in mud. At last, and within not too much time or energy spent, I arrived at Cataract Creek and set up my tent. While I don't mind backpacking alone, I also find comfort in having at least one other party nearby in camp, just for a bit of security. There was no one else there; it was just me, the trees and a couple of babbling brooks. I reasoned with myself that it was better than having a crying baby nearby, but I still wished for some company. 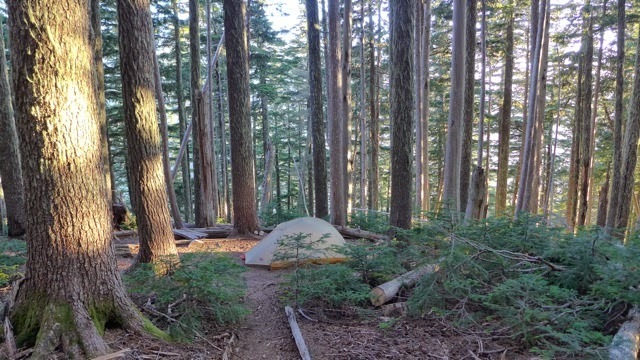 While I was cooking dinner, hikers started arriving until nearly all 6 sites were occupied. 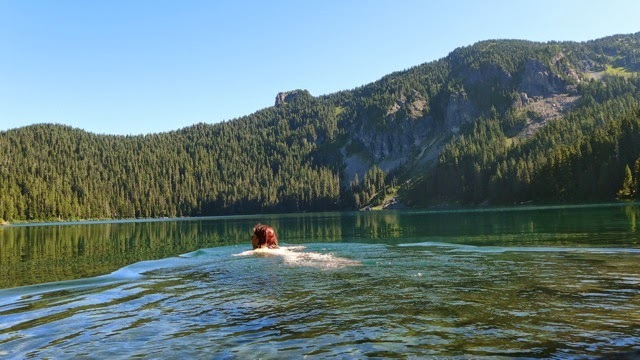 Although this was off the Wonderland Trail, some backpackers used it as an alternative route because, well, it was too damn beautiful to miss. 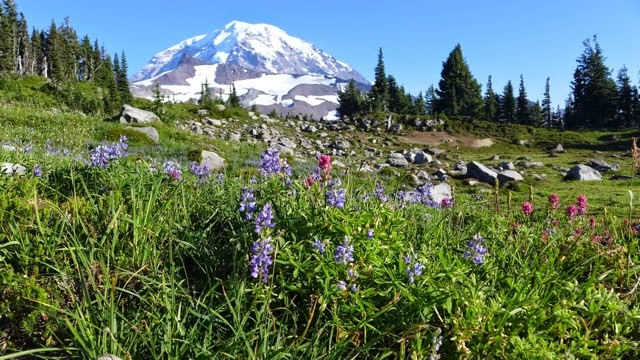 The next morning, I got a relatively early start at 8:45 and set off climbing up and up, through rock fields, by waterfalls and flowers, stretching toward the high point of 6,400', a divider between Seattle and Spray Parks. I have no memory of this section of the hike from when I did it years ago, though I trust myself that I did do it. While in the flower fields, I had tried to stop for a mid-morning snack, but was soon overcome with buzzing around my head and invaders poking into my skin. Mosquitoes and flies were plentiful and kept me up and moving. 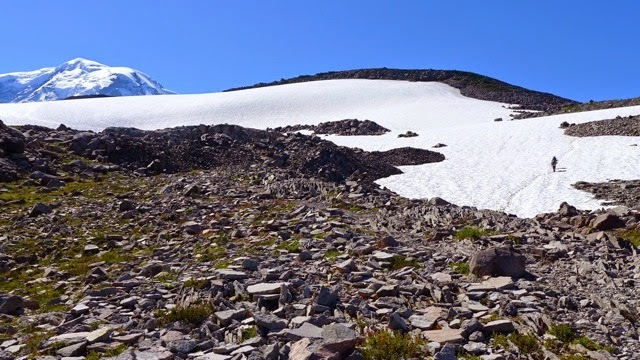 I finally found solace on a rocky outcropping between two snow fields, where no bugs buzzed. Another backpacker stopped with me and I finally got to have some conversation. The hiker (I never did get his name) was from Springfield, Ohio (I immediately thought of "The SImpsons", but figured he was tired of that comment) and spent his vacations backpacking in many of the wonderful National Parks. When I told him I was from Seattle, he was clearly envious, which made me fill with pride for my city and region. I did a lot of eating, while he did a lot of talking; backpacking solo will drive you to one or the other. 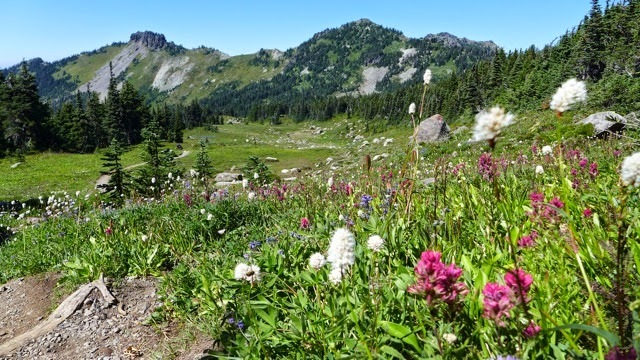 After reaching the 6,400' crest, without too much trouble from lingering snow, it was all downhill, with flowers, views and maybe a bear or marmot sighting to come. While the flowers were a bit past their prime in the higher elevations, they were pretty amazing lower down. 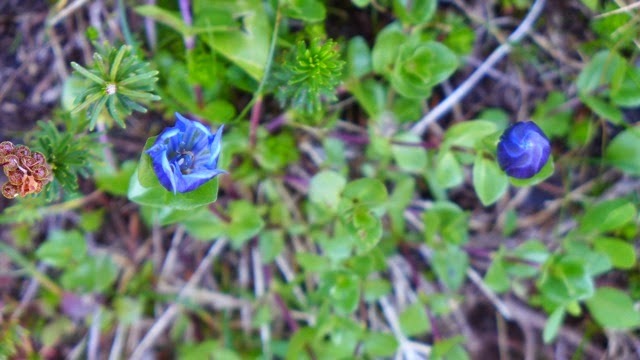 However, I did spot several clumps of Gentians which are known to be the harbingers of fall. I tried to ignore them, but they kept looking at me, some fully opened and some through their closed, camera shutter-like form. I had planned to do a lot of lounging in the meadows since the day's hike was only 5.5 miles, but the bugs were driving me away. I also realized that the harsh midday sun on Mt Rainier would make photos unattractive and if I waited until later in the day, I could get better shots. I decided to descend to the camp, set up, relax and return later in the day. Camp for the second night was at Eagles Roost which is just like it sounds, perched high on a cliff overlooking the Mowich River. Through the trees, which provide shade, is a great view of Rainier. Downhill from the sites is a composting toilet with a fence for privacy and an even better view of the mountain – deluxe! 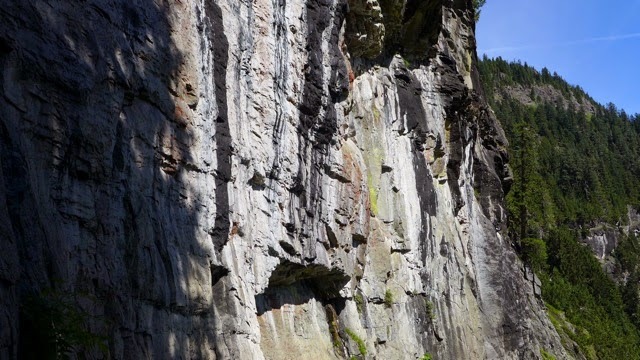 Once I had set up camp, hung my food bag on the bear pole and did some meal prep, I made my way up to Spray Falls and then back to Spray Park, just a mile up the trail. While the sun was at a kinder and gentler angle, the bugs were still raging. I must have been the only mammal in the area, as they were buzzing and biting non-stop. I never did see the bear that usually frequents the area; she probably knew better, less buggier places to roam. I snapped a few photos, had a snack, then retreated down toward the Falls. 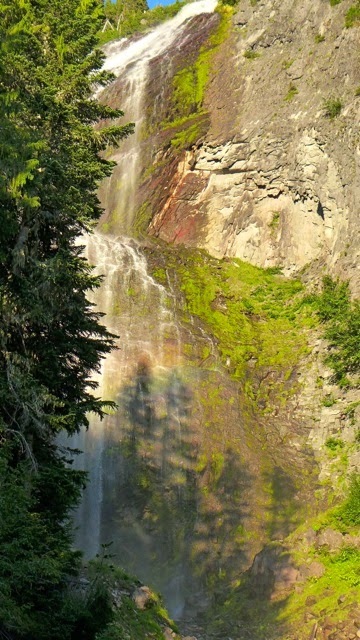 At that time in the day, the sun was shining on the falls, producing a rainbow and shadows of trees were projected onto the rocks. Forget seeing these falls during the day; linger longer on the trail and check them out near sunset. Back at camp, I talked with my neighbors and shared their view of purple mountain majesty – the setting sun turned Rainier pink and purple. I think everybody in camp wanted to be their friend at that point! In the morning, I packed up and had a leisurely hike out to the trailhead at Mowich Lake. 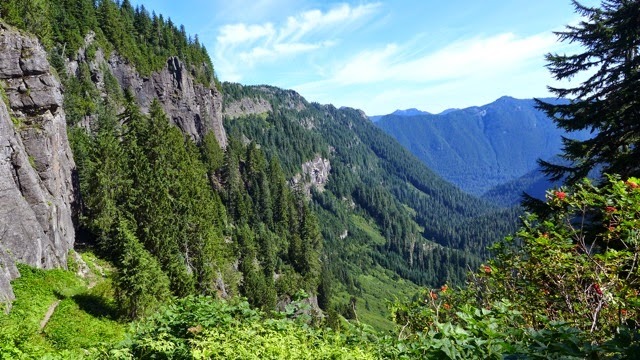 On the way, I stopped at the viewpoint which is named something like Eagle Cliff, which has an unobstructed view of the mountain and which is, in my opinion, mandatory for a stop to ogle. At the trailhead, I grabbed clean clothes from my car, headed for the lakeshore, plunged in a few times, coming out clean. Although the first time I did the loop, I was more youthful, the second time around, I was smarter and got more enjoyment from it and will take home more memories.